Finished in a crisp Polaris White with a Privacy Glass upgrade and a Black and Red Leather Upholstery this stunning luxury auto saloon combines style with comfort and great performance. 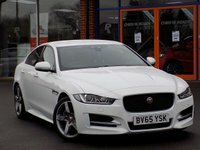 Its excellent specification includes Satellite Navigation, Rear Camera, Heated Front Seats, DAB Radio, Bluetooth, Cruise Control with Adaptive Speed Limiter, Front and Rear Parking Sensors and much more. Please ask for details of our fantastic finance and warranty packages, subject to status, T's and C's apply.